All seems original except maybe the trem arm as this is black and seems fractionally thin although does lock in. 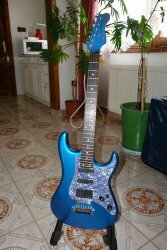 The guitar was given to my son by my cousin. It has been under his bed for 14 years since being given to him by his Godfather. It hasn’t been played in this time and as yet although I have cleaned it up and changed the strings I haven’t been able to plug it in so the electrics are untested.